Dawn Brown, PT, DPT, OCS, a NIU Clinical Assistant Professor and Director of Clinical Education in the DPT Program, has recently become an American Physical Therapy Association (APTA) Board Certified Orthopedic Clinical Specialist. Orthopedic clinical specialists are experts in evaluating, treating and managing patients with orthopedic conditions. Some of these conditions include sprains, strains, tendonitis, arthritis, ligament tears, muscle tears, joint/muscle/tendon inflammations, post fracture injury, joint stiffness, joint pain, rotator cuff repair, ACL (Anterior Cruciate Ligament) reconstruction, and post arthroscopic and total joint replacement surgeries. The specialist certification program provides formal recognition for physical therapists with advanced clinical knowledge, experience, and skills in a special area of practice and to assist consumers and the health care community in identifying these physical therapists. The Orthopedic Clinical Specialist (OCS) has shown advanced knowledge and proficiency in orthopedic physical therapy practice based on the most current evidence and modern practices. Applicants must prove years of experience in orthopedics as well as take an intense national exam covering all areas within orthopedic practice. Brown is an active member of the Illinois Physical Therapy Association (IPTA). 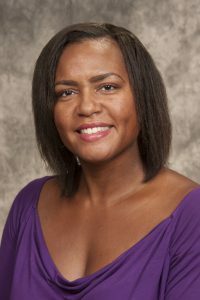 She is chair of the Diversity Task Force, formed to increase recruitment and retention of underrepresented minority physical therapy and physical therapist assistant students, faculty, and employees.